Judith is an active member of several art organizations in Maryland and in Massachusetts. 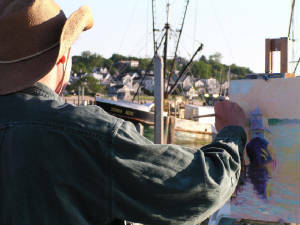 She is a member of the Maryland Pastel Society, Provincetown Art Association Museum, Castle Hill Truro Center for the Arts, and the Mid-Atlantic Plein Air Painters Association. She has participated in the Mid-Atlantic Plein Air Painters Associations annual fall event know as Paint Annapolis. She is a regular participant in the Howard County Arts Council's Celebration of the Auction fundraiser, the PAAM 12” by 12” show, and the Outer Cape Auction. She has made presentations to both the Maryland Pastel Society and the Laurel Arts Guild on her use of color. On March 26th 2008 she was also featured as a salon artist on a Maryland Public Television show called Artworks This Week. SARTIST'S STATEMENT: "I hope to draw you into my paintings, touch you with color, jog your memory, renew your admiration of God's creations, and remind you that peace is possible."